It was a warm night and we woke up to what was forecast to be a hot day. After scrubbing up I did a few chores and The Chef did a bit more hand washing, mainly jeans and trousers as they were sure to dry thoroughly today. 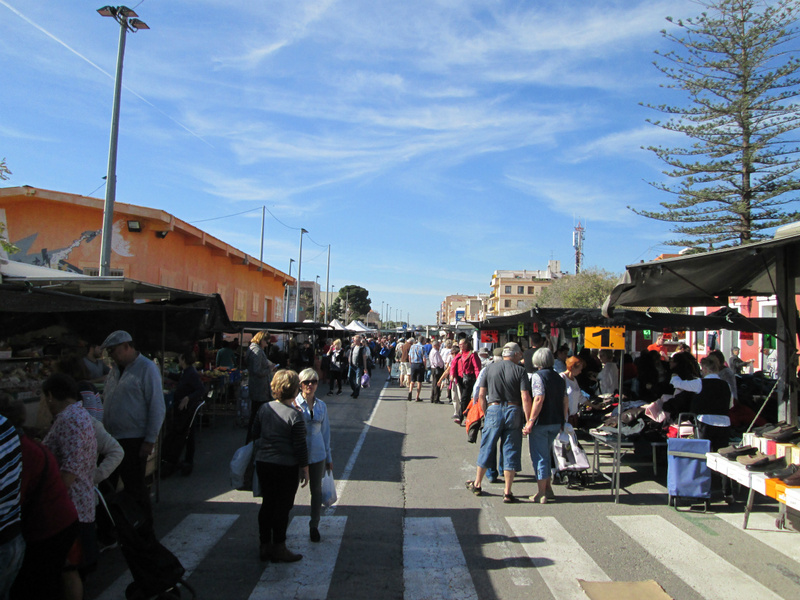 We then wandered down in to town to the Thursday market. We were looking for more oranges, the last lot we bought came from Lidl and were a bit stringy and not as juicy, so in future we'd stick with the market, then it was black grapes to munch with my blue cheese and when we got there an impulse buy of a large punnet of super-sized strawberries. They were something like €2.50 for a kilo, so at the current post Brexit Referendum exchange rate that's about £1.10 a pound, but still worth a try. There was an element of indecision regarding our selections but we got there in the end. On the way back The Chef drew some cash out of the Santander ATM before popping in to Lidl for some nice crusty bread. It was decided we'd pop over to the supermarket across the road from the campsite for some Greek Yoghurt to go with the strawberries later. On arrival back at the campsite I popped in to the bar and bought an English newspaper, I didn't realise they sold them until one of our neighbours recently gave me his after he'd finished with it. They cost more money than they are worth, and so must be viewd as a bit of a treat. We got back just in time for the 12:00 presentation on Valencia. Each planned excursion gets one or two presentations before the departure date. There were only about nine of us in there which unfortunately included 'The Intellectuals', Mr & Mrs Guardian-Reader, who talked most of the way through the video, because of course in their minds they had something important to say which we lesser mortals should be listening to. Then it was back to Base Camp for lunch, a treat, fish fingers with a squeeze of tomato ketchup in a crusty baguette. So you see, you really can embrace the Spanish lifestyle regarding a love of seafood if you try. This afternoon was spent sitting around soaking up the hot sunshine, and I mean hot, it was forecast 28˚C, and it must have been all of that. In fact I unfolded the awning from the side of the vehicle, something I seldom do. This gave us sanctuary from the sun when we wanted it. The only thing to spoil things was the continual barking of the dog belonging to the Spanish couple within our cul-de-sac, It's not a very big dog, and under different circumstances rather nice, but it's very noisy. I can't believe that a responsible dog owner would sit in their awning or caravan and listen to their dog continually barking yet do nothing about it. As always I don't blame the dogs, I blame the owners. So off to the Reception desk I went to complain about it, and I give them their due, they soon sent somebody round in a golf buggy to speak to the owners, after that we got some peace, and so did all of our neighbours. I finally managed to drink enough of the Five-Euros-For-Five-Litres rot-gut Rosé to allow The Chef to use the empty bottle to put fresh chlorinated water in from the special tap at the end of our cul-de-sac for daily drinking. This evenings meal was a pizza and salad, the pizza being created by The Chef from a ready-made pizza base. Very nice it was too, followed by strawberries bought this morning from the market topped with Greek yoghurt. They're huge, not as sweet as the smaller ones but much nicer than we expected. It made a nice change and was a real treat. This evening we have decided to leave the wind-out awning deployed and as a precaution I have attached two storm straps to the channel running along the front of the awning. This should prevent the wind from getting under it and trying to lift it. They have been secured to the ground by steel pegs which are driven in to the hard-standing surface with a power drill. I saw a German motor homer do this at the campsite at Lake Bled in Slovenia a couple of years ago and thought it quite a cool idea. We shall be lowering the average scores of the regulars up at the Petanque pitches tomorrow afternoon, the alternative being to sit outside and enjoy the sunshine.